Last night, we reported that the first trailer for Avengers: Age of Ultron will debut during next week's episode of Marvel's Agents of S.H.I.E.L.D., airing Tuesday, October 28 at 9 PM ET on ABC. If you can't wait that long to get your first glimpse at this Marvel Phase Two adventure, two images have leaked from the first trailer, which feature the massive Hulkbuster armor, which was teased in new promo art from last week, and the villainous Ultron himself. While it isn't clear exactly where these images came from, Screen Crush reports that they debuted on Twitter. They can confirm the images are authentic after having seen the Comic-Con footage from July. Take a look at the images below, then read on for more information. It isn't known if fans will only see a teaser or a full-length trailer during Marvel's Agents of S.H.I.E.L.D., but it's possible that this will be the same footage shown during New York Comic Con earlier this month. We also reported last month that the first teaser will be attached to prints of Paramount's Interstellar, which arrives in theaters November 7, but that has not been confirmed at this time. 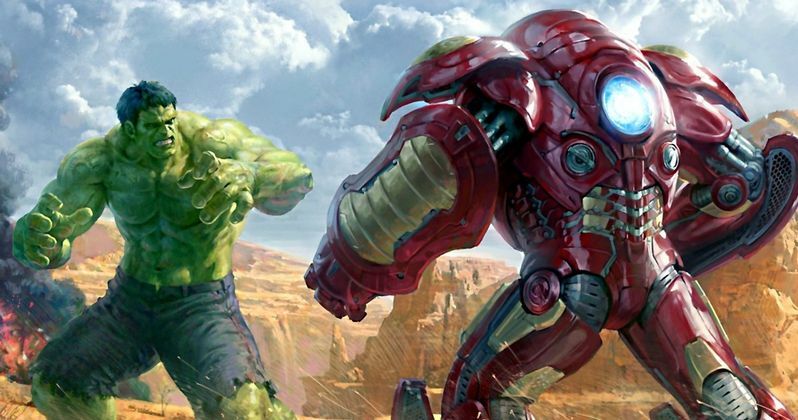 What do you think of Hulkbuster and Ultron? Chime in with your thoughts below, and stay tuned for the trailer next week during Marvel's Agents of S.H.I.E.L.D. on ABC.